Squashing a cockroach is not easy if the insect scurries away or escapes between a groove in your shoe. In fact, the pests are designed to move quickly under this type of pressure. The American cockroach can flatten itself down to a quarter of its height and withstand almost 900 times its body weight without injury. And the bugs can move about 50 body lengths per second, which is equivalent to a human running 210 miles per hour. Roaches can even run at high speeds when flattened in half. These observations about the bug's speed and flexibility led to a spark of insight for UC Berkeley researchers. 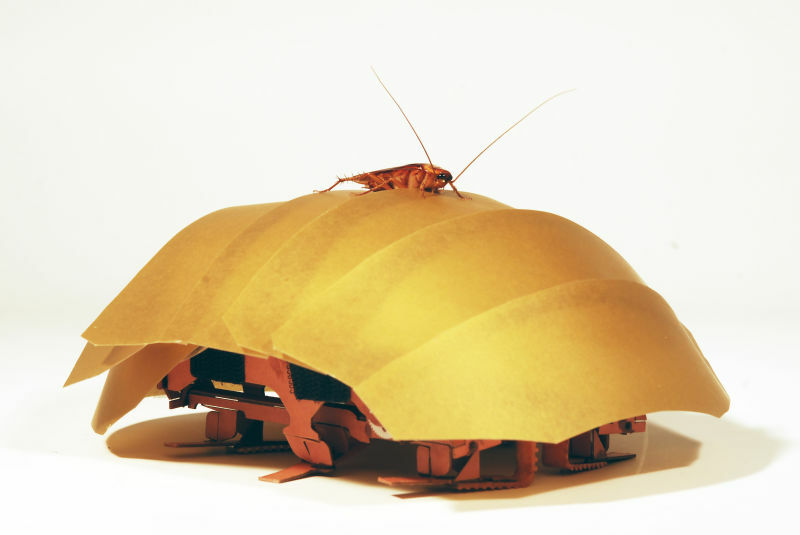 As a graduate student at UC Berkeley, Kaushik Jayaram worked with integrative biology professor Robert Full to create a pliable robot modeled after the American cockroach. Their design is outlined in a Proceedings of the National Academy of Sciences paper published today. The robot's flexible shell covers legs that splay outward when it's smushed. On top of the palm-sized robot is a plastic shield similar to the tough, smooth wings covering the back of a cockroach. When tested under pressure, the robot could run through crevices half its height. "Growing up we’ve all seen cockroaches creep into buildings but what was so amazing to us was that they could squeeze through a gap the size of two pennies stacked on top of each other," says Jayaram. Because it can squeeze through small openings, the cockroach-inspired robot is extremely desirable for search-and-rescue operations. After a natural disaster, a swarm of robots could penetrate small openings in a pile of rubble to look for survivors. "This robot is a first step toward a low cost first responder robot," says Full. "Lots of robots now are really expensive and can’t get into tiny cracks but a swarm of small robots could get info about what areas are stable." The robot can be controlled via a joystick and moves for up to ten minutes before the lithium ion battery dies. Jayaram said the goal is to get this up to thirty minutes. Jayaram and Full's flexible machine is part of a trend toward soft robotics. In 2011, scientists at the Wyss Institute created a starfish-like robot that could squeeze through a mouse hole. "In the past we’ve made things very different from this--human technology has tended to be large stiff things with right angles." says Full. "As things take on more characteristics of nature they become more pliable and durable. The master shape changing animals are often considered to be worms, and slugs and octopi, which are extremely flexible." Jayaram is continuing to improve the robot prototype at Harvard University's Wyss Institute for Biologically Inspired Engineering, working to equip the next generation of robots with sensors and cameras. The goal is to create robots that could wirelessly transmit data to the cloud for FEMA or other government agencies to analyze. The US Army is also interested and has provided partial funding for Jayaram and Full's project. Jayaram says he expects to have a new cockroach-inspired prototype equipped with cameras and sensors in about a year.